THE WINNER OF THE GOLDEN MAXTACK – JOHN CASSERLY! As everyone who follows our Facebook should know, we recently ran a promotion in all Bunnings Warehouse stores called “Find The Golden Maxtack”. This offered up the chance to find a cartrdige of Sika Maxtack, hidden in an unknown store, that had a bright golden colour. We didnt even know where the Sika Maxtack was! We had a fantastic response to the promotion, and were thrilled when we received an email and a package from one John Casserly. John is a builder from Castle Hill in NSW, and like most tradies in Australia, has been using Sika products for years. Particularly Sikaflex-11FC, which he reckons can fix just about anything. He was working on putting up some architraves and skirting boards in a home he is currently building at Stone Cutters Ridge, and hence grabbed the Sika Maxtack, knowing that it was going to be a good product, that would stand the test of time and would go up quickly. Little did he know, he had gone and grabbed himself an instant $5,000 in cold hard cash! 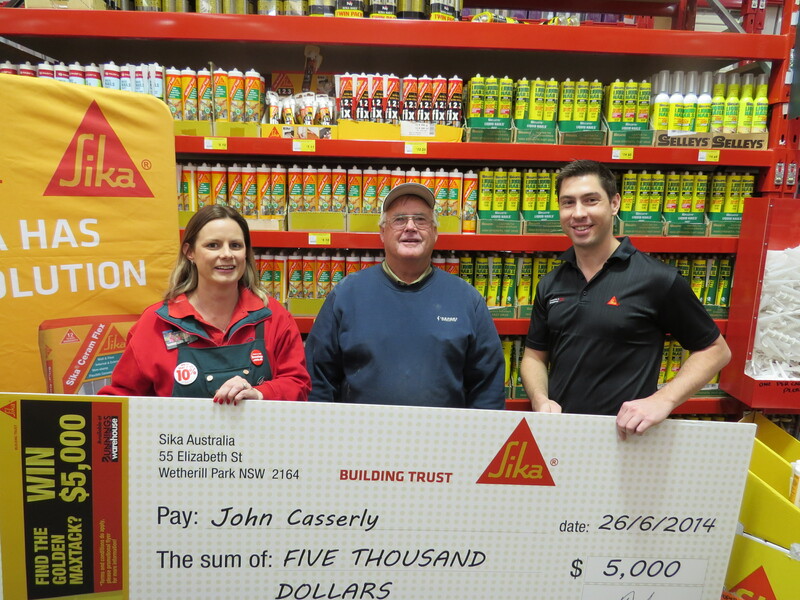 John was presented the giant $5,000 cheque at his local Bunnings Store, Castle Hill, with Sika Australia’s Key Account Manager David Houghton and the lovely Kerrin from Bunnings in attendance. The question that we were dying to know the answer to, was what John was going to do with his fantastic $5,000 prize. And thats where this story really starts to make us feel all gooey inside. Turns out, that John was going to use this prize to get himself and his wife to their son’s wedding in Germany. 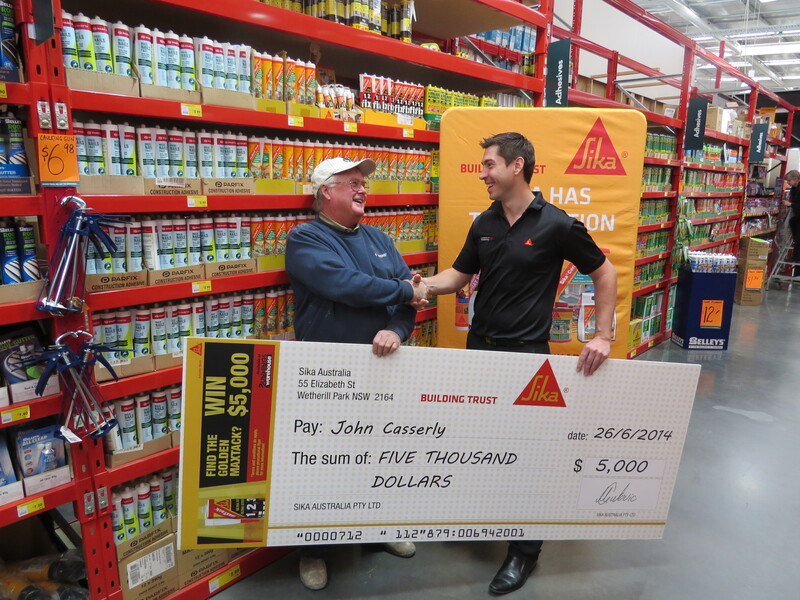 The prize money couldn’t have come at a better time for John and his family, and the team here at Sika are absolutely thrilled that we can help a loyal customer get to such an important event in their lives. “Ill never complain about the price of a Sika Product again!” laughs John. Congratulations John for finding The Golden Maxtack, and we hope you enjoy your son’s wedding. To be the first to know about promotions that Sika Australia are running, sign up to our newsletter. To keep up to date with what Sika Australia are doing, you can ‘Like’ us on Facebook, or follow us on Twitter. Have you got questions about any of our products? Check out the website for more information. ← HOW DO I GET SIKAFLEX OFF MY HANDS? !